Traditional brand valuation metrics may be as valid or relevant as connecting the bird droppings on your windshield to plot Twitter’s flight path. As a brand, it has catapulted into the wild blue yonder, having captured users around the word with instantaneous access and response to news posts. Brand equity, or “good will toward a brand,” a measure of the differential between book value and perceived value, is off the charts. So far off the charts that it has us scratching our heads. To be clear, we care about brand value and advertising value, not stock price. No one at Articus owns Twitter stock - a good thing since its price has fallen roughly 58% from a high of $75. No surprise from a company that in eight years has not managed to turn a profit. No surprise as the lock-up expired last week on roughly 480 million shares and a brood of early investors took to feathering their own nests. But most worrisome for the bird are its decelerating growth in user base and a decline in user engagement and time views. Regardless of how you view Twitter – social media platform or news service – the only way it can effectively monetize its platform is through economies of scale. If it can acquire more users with deeper engagement and time views, it may generate the advertising revenue necessary to keep flying. The bird is laying apps [sic] like crazy to drive engagement. A prime example is the new Amazon partnership that allows users to respond to product tweets with “#AmazonCart.” While perhaps a plus for ad revenue, it is less exciting for users who still need to complete their purchase with Amazon directly. By the way, Sino Weibo, China’s Twitter equivalent, managed within-app purchasing two years ago. But it does open the platform up to other immediate-response-minded advertisers. We’ll end on a light note (or dark note, depending on your POV). 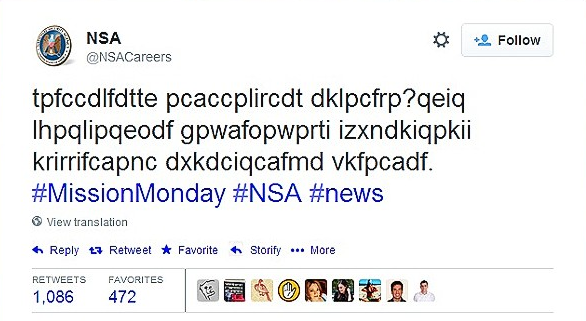 Look who is tweeting recruitment ads to code breakers everywhere?